Award-winning, Hackney-based photographer Zed Nelson's lens has touched on some of the most troubled areas around the world, from Israel to South Sudan, but now he turns his attention to his old stomping ground. 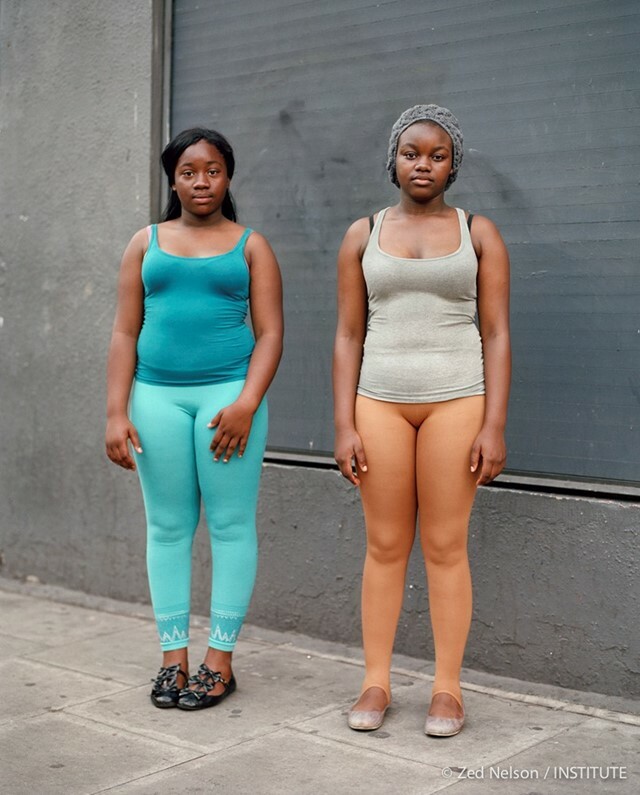 Growing up in Hackney, Nelson was no stranger to scenes of crime and poverty but now as the love-worn landscapes are gradually replaced by hip bars and modern apartments, his hometown becomes unrecognisable. This rapid and unexpected conversion of the borough into one of the trendiest London areas inspires Portrait of Hackney, a documentation of the conflicting, shifting images of Hackney side by side. It reflects on the juxtaposed realities of wealth and poverty, aspiration and hopelessness. The airy and transparent atmosphere of the pictures and the roughness of the subjects mediate the clash of cultures and identities, echoing the beauty/ugly hybrid of the borough today. Tell us a bit about your photography story so far? Zed Nelson: I've lived there all my life, since I was five years old. It was always shabby and run down, and in many ways represented a place to get away from. I began to travel extensively as a photographer – focusing on serious political issues - Afghanistan, Somalia, Cuba. Then I began to look at contemporary social issues – and spent three years producing a book about gun culture in the USA (Gun Nation), then five years on another book exploring human vanity and the insidious power of the global beauty industry (Love Me). I visited 17 countries making work for this project, and when it was complete I went home and didn’t want to get on another airplane again. I’d been travelling for years, and had largely ignored my own country and neighbourhood. When did that all change for you? Zed Nelson: Hackney was changing. It suddenly seemed very alive, crazy and absurd. It was always poor – one of the poorest boroughs in London – but suddenly it was becoming trendy. I would joke that in Broadway Market on a Saturday afternoon (hipster Ground Zero) you could no longer tell if someone was the editor of a fashion magazine, or someone who had recently escaped from a mental asylum. They looked the same. Were they blindingly trendy, or having a breakdown? Was that mullet ‘ironic’, or the result of years of institutionalized care? One day I laughed out loud pedalling home on my bike. I thought, I must document this moment in time. By taking the time to walk the streets and observe, I slowly fell in love with the area. The images are a kind of meditation on the confusion of cultures, clash of identities and the beauty and ugliness that co-exist in the borough today. Hackney is a socially, ethnically diverse melee. It has violence, beauty, wildlife, concrete wastelands, poverty and affluence jumbled together, vying for space. It is tattered and fractured, but very alive. You mention the rough start you had growing up in Hackney and how photography saved you from that lifestyle, why do you think that is? Zed Nelson: I went to a forward-thinking experimental primary school in East London that encouraged art and independent thought, until my parents, as 70’s hippies, plucked me out of school and took me and my sister on a one-year road trip to India, traveling overland from Britain in a diesel truck. When we returned I had the misfortune of ending up at a rough comprehensive school in Hackney. I found out years later it had the worst academic record of any school in the capital, and in subsequent years was closed down and demolished. The school was encircled by housing estates and chain-link fences, set on a concrete landscape without a blade of grass in sight. It was not a place of learning, but of survival. Over the next few years I pierced my ears, shaved my head into a mohican, got a tattoo, was arrested for smoking dope, took acid in Abney Park cemetery, and buzzed around the streets in a motorbike gang. We were hardly Hells Angels though – we were so young we were restricted to 100cc motorcycles with L-plates. Most of the time it was harmless fun, but it turned dark. One friend became addicted to heroin and was murdered in a squat, while another got sent to jail for GBH after a fight got out of hand. Basically, I was the product of a bad inner city education, with the kind of friends that go with it. At the age of 18, photography gave me a passport back to civilization, and the minute I started college, I remembered there was so much more to do. The quotations scattered through the book give an almost voyeuristic 'Overheard in…' vibe – where did they come from? Zed Nelson: The quotations in the book are snippets of conversations I overheard while walking the streets and parks of Hackney. I never tried to listen-in, they were just snapshots of conversations that presented themselves to me. These quotes seemed revealing or funny or tragic at the time, so I would write them down in a text and send it to myself. You also quote Dickens' famous Tale of Two Cities quote, why is that? Zed Nelson: Aside from anything else, the name seemed to apply to Hackney – to resonate with the two worlds that exist side by side in the area – the ‘have’s and the ‘have-nots’”. Also the text seems to describe the same sense of flux, change and madness that manifests itself in Hackney today. Where do you stand on the gentrification of Hackney? Zed Nelson: In 2010, a 16 year-old schoolgirl was killed by a gunshot fired through the window of a fast food restaurant in Hackney. The gunman – a young gang member - was riding a bicycle. On the same day, two men on a motorbike shot at two youths walking along the street, who also returned fire. Despite Hackney’s crime and relative poverty, the borough is fast becoming London’s trendiest neighbourhood. Down the road from the shootings, contemporary design studios and modernist apartment blocks pepper the landscape – they're like out-of-place totems of middle-class gentrification. I'm watching with fascination as the area goes through a metamorphosis – and witnessing an extraordinary contemporary social situation develop. The social landscape for an under-privileged teenager growing up in Hackney - one of London’s poorest boroughs - is a million light-years away from the new urban hipsters who frequent the cool bars and expensive cappuccino café’s springing up in the same streets. These worlds co-exist side-by-side but entirely separate, creating bizarre juxtapositions of wealth and poverty, aspiration and hopelessness. Do you still love Hackney despite this gentrification? Zed Nelson: I enjoy Hackney today more than I ever have. But I also watch with a growing concern for its identity. As the property developers move in and gated luxury apartments spring up on every street corner you have to wonder, how will it end? One shot in this collection particularly caught my eye – the up-rooted tree shot, what was it about that that caught your attention? Zed Nelson: There’s a re-occurring motif in my images of Hackney of cracked pavements and walls, melting tarmac and weeds and roots bursting through concrete. It is as if nature is trying to reclaim the land, and Hackney – under-funded, neglected and poorly maintained – is constantly being sucked back into the earth. It amuses me to see this, as I find other, wealthier areas where nature has been conquered depressing and disconcerting – covered over in tarmac, cemented and de-weeded. I hope the property developers don’t win. A Portrait of Hackney by Zed Nelson is published by Hoxton Mini Press at £12.95. Limited signed and numbered collector editions at £45.00.